The workout on a rowing machine is versatile and extremely important for the body! Rowing provides an optimal total body workout. Whether old or young, male or female, trained or untrained: Everyone who wants to keep himself athletic fit, is in good hands with a rowing machine. Discover the benefits of rowing and important tips and tricks for the right training here! Why is rowing important for the back? What makes a good rowing machine? Rowing provides an optimal total body workout. Indoor rowing is popular not only for competitive athletes. Whether old or young, male or female, trained or untrained: Everyone who wants to keep himself athletic fit, is in good hands with a rowing machine. Discover the positive effects of rowing and why you should consider also getting a rowing machine! Rowing is one of the healthiest sports ever. About 80 percent of all major muscle groups are involved in the flowing movements of rowing. The muscles and stamina are equally trained. You can see the result looking at professional rowers: Their well-toned body makes them real model-athletes. Using a rowing machine you can realize this at home. Strong resistance for short periods of training let your muscles grow. For this reason, rowing is suitable for both men and women. Particularly shoulders, arms, belly, legs, calves, bottom and back are trained with rowing. This builds up muscles and tones the body. According to a survey of "Apotheken-Rundschau" 65.2 percent of the population are at least once a year affected by back pain. The ever-present pain has a large impact on the psyche. According to “Zeit-Online” the orthopedist Ulf Marnitz from the Berlin back-center has figured out: Who at least has three months of back complaint gets depression with a probability of 60 percent. Reason enough to put an end to back pain. The causes of complaints are often untrained back muscles. With regular rowing, whether with an ergometer or on water, the problem can be eliminated. The entire trunk musculature, including the deep muscles that provide stabilization of the spine, is trained. Besides building muscles, the regular rowing training strengthens especially your cardiovascular system. A stable cardiovascular system plays a crucial role in living a healthy and vital life. Therefore, it is nowadays indispensable to train the strength of heart and blood stream. A dilatation of the pulmonary capacity results from a stronger cardiovascular system, an improvement in cardiac output and a strengthening of the body’s defenses. Many reasons why you should start with your rowing training today. In addition, cardiovascular training is the prevention of risk factors such as high blood pressure, overweight or metabolic disorders. Because of the adjustable load, rowing training on the ergometer is often recommended for risk patients. This proves that the rowing sport is a boon to your health. Regular rowing training is a great way to specifically strengthen the heart muscle and the cardiovascular system and prepare for the daily physical stresses. In rowing the whole body is involved, because of that the optimal conditions for effective fitness training are given. From workout to workout you’ll quickly notice that you get stronger; persistent and not least you get more self-confident. An improved condition brings many positive effects with it: improve performance and concentration ability and stress is reduced faster. Furthermore, the risks of high blood pressure or diabetes are greatly reduced. Thus, rowing training can play a part in reducing the risk of heart attack significantly. Calorie consumption guaranteed! Because the entire body is involved in rowing, it is the ideal fitness training. Particularly persons with overweight are in good hands with a rowing boat or an ergometer. Different from running or cycling the joints are hardly stressed. Nevertheless, the body fat loss is very effective. With low resistance and long operating time around 700 calories per hour are possible. The shrinkage of muscle mass, which often occurs with an ordinary diet, is prevented by the effort. ... that one hour of rowing burns about 700 calories? ... that 80 percent of all the major muscle groups are involved in the flowing movements of rowing? ... that rowing is one of the healthiest sports ever, and can be done at any age? ... that risk of injury is particularly low while rowing because of the smooth and shock-free movements? Increasing muscle building and swiftness with rowing training - perfect for men! Conventional fitness equipment usually focuses on specific body regions or specific muscle groups. With rowing training, however, it is different. Rowing is a total body workout, in which both, the muscles and the stamina are equally trained. With strong resistance and short periods of stress, the muscles are made to grow. Especially back, arm, leg muscles and swiftness are trained with it. For longer periods of stress, however, the endurance is improved. With an improved endurance you automatically prevent many diseases that often occur by untrained people at old age. 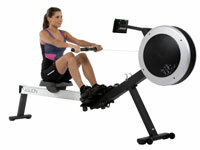 Burning calories and tighten individual body regions with rowing workout - perfect for women! Not only for men rowing offers optimal training, more and more women are discovering the benefits of rowing, as muscles and fitness can be training at the same time. Unlike a treadmill or stepper, the rower is claiming the whole body. In particular, legs, arms, shoulders, belly and back are trained functional. With training of the entire body, not only the back is strengthened, arms and legs are toned and the endurance is trained, but also the calorie consumption is boosted and weight reduced. Anyone who wants to improve his stamina and burn calories, should row with low resistance as long as possible (eg 45 minutes). At beginning of a training session mainly glycogen (storage form of sugar in the body) is burned. Only with increasing training time, the body goes for the fat reserves. During long training sequences weight loss is bound to occur. Muscle building & strengthening the back! Who focuses on building muscle, should train in short periods and high intensity. You should set the resistance that high, that the muscles are almost exhausted after about five minutes. The stroke rate should be low - 16 to 20 beats per minute would be ideal. A brief recovery period follows, which can be filled with loose rowing or gymnastics. Afterwards training is resumed with high resistance and low frequency two times for ten minutes. The body will move to its performance limits and muscle gaining is initiated. Successes will be visible soon. 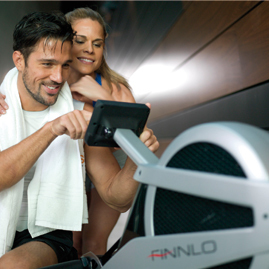 The FINNLO rowing machines are equipped with several training programs that make the workout more varied. For example a fitness mode provides different loads in one training session. And those who want to fight a little competition have the possibility to compete against the computer in the race program. The duel "Man vs. Machine“ will boost you to peak performances. From workout to workout you get more powerful, enduring and not least more confident. Using a rowing machine can train the whole body. About 80 percent of all muscles are involved in the movement. Especially the shoulders, upper arms, legs, calves and belly, back and buttocks are claimed. Rowing ergometers are therefore the optimal solution to bring strength and endurance in shape at the same time. Accordingly large is the range of devices. The range goes from cheap products for about 100 euros to high-tech rowing machines for more than 1,000 euros. Beginners may not notice the differences between the ergometers instantly, but they are of great importance. Rowing machines are manufactured in two different ways. For some devices, both rowing arms can be individually and independently pulled, others pull both arms simultaneously with a cable wire. With two independent handlebars, the movements on the water are simulated much better. However, wrong training movements quickly slip in and possibly cause injuries. For pure fitness training a rowing machine with cable wire is more suitable, because the coordination is easier to handle. An important quality criterion at a rowing ergometer is the braking system. Cheap hydraulic cylinders are not recommended. They have a low life expectancy and can harm the joints and tendons due to the non-flowing movement. 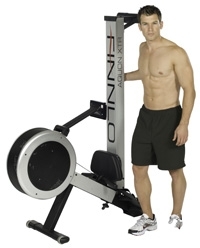 Better rowing ergometer are the ones with a magnetic brake system or an eddy current brake. Braking is done by multiple permanent magnets or by one electromagnet. There the rowing movements are fluid. A high quality alternative would be the air-resistance system. A wind wheel, which rotates continuously due to the motions, provides the resistance. The ideal would be a combination technique of magnetic and air resistance, as used for example by FINNLO top devices. Depending on traction and pulling speed the wind wheel provides an increasing intensity. Those who prefer to train with low tensile power and yet high braking force will appreciate the magnetic resistance. Another point in which the high quality devices stand out from the crowd is the quality of movement. The sliding seat should be comfortable and low-friction. A jerk-free device creates the feeling as if you'd actually glide over water. In addition, the noise level must not be too loud. The cheap devices will save you money but will strain the neighbors’ nerves. Large and heavy people need to be extra careful in choosing the rowing machine. With cheap equipment the maximum user weight is partially only 100 kg. Thereby, rowing is suitable exactly for people who are overweight because of the joint-friendly workout. Quality ergometers, for example by FINNLO, can load up to 150 kilograms. A long slide and a long strap are also important. Who stands about 2 meter tall would be well served, for example, with a drawstring of about 225 cm in length. Of course, fitness training should be fun, too. That’s mainly accomplished due to the training computer. It not only supplies the athletes with all the important information (beats per minute, distance, calories burned, etc. ), but also provides a variety of training programs at high quality equipment. Fitness workouts and racing programs in which the athlete competes against the computer provide entertainment. Assuming the display is continuously inclinable, the rower has all the important data in view. Whether strength training, endurance training or competition preparation - a rowing machine is versatile. Depending on the training purpose it will be trained with varying intensity and duration. Anyone who wants to improve his stamina and burn calories, should row as long as possible with low resistance (eg 45 minutes). The reason: At the start of a training session mainly glycogen (storage form of glucose in the body) is burned. This is faster mobilized of the body. Only with increasing exercise duration, the body goes for the fat reserves. Strength training on the rowing machine works completely different. In order to make the muscles grow it should be trained in short periods and high intensity. First, however, the body must be pushed on operating temperature with a short warm-up. Soft jogging, cycling or rowing, and then stretching would be recommended. Then the actual training begins: The resistance is set such high that after about 5 minutes, the muscles can be felt properly. The stroke rate should be low - 16 to 20 beats per minute would be ideal. After that, a brief recovery period follows, which can be filled with soft rowing or gymnastics. Then training continues with high shock resistance and low frequency, twice ten minutes. In doing so, the body gets to its performance limits. The training is followed by a short stretching. Even competitive athletes train frequently in short sections. Here, the exercise duration, exercise intensity and stroke frequency is varied. Thus, the body is constantly faced with new challenges and must adapt accordingly. Unfortunately, the focus on the correct stroke frequency often makes you permanently looking at the training computer. So, the subjective feeling of stress is lost. Therefore, you should ignore the screen and just keep rowing by instinct. On hammer.de, the manufacturer shop of HAMMER SPORT AG, you can buy the rowing machines models online. You get The FINNLO Aquon Evolution, the FINNLO Aquon Pro and also the FINNLO Aquon Pro Plus at hammer.de inclusive 12 months extended warranty and free delivery (as of 45 EUR within Germany). The HAMMER SPORT AG, the manufacturer of FINNLO premium rowing machines, also offers you manufacturer's service and top advice!